A condition known as empty nose syndrome (ENS) is produced as a result of improperly performed sinus surgery. 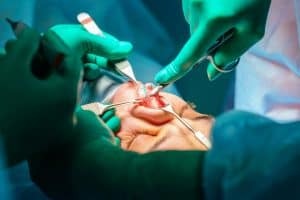 When a surgeon performing this procedure inadvertently or carelessly removes one or more bones in your nose referred to as turbinates, the consequences can be devastating for the patient. These turbinates consist of a network of bones and blood vessels that are designed to moisten, warm, and filter the air you inhale. For instance, when you come down with a cold, the moist surfaces of these turbinates swell up, giving you a stuffy nose. Although the name implies that the nose either is or feels empty, the actual result of this condition gives you a sense that your nose is stuffed up, with the feeling that you are unable to breathe. If you have sustained this injury as a result of nose surgery, you may have the right to pursue damages in a medical malpractice lawsuit. Schmidt relates that even though her body was actually receiving sufficient oxygen, due to the damage done to her turbinates that led to the ENS condition, her brain did not detect that she was receiving enough oxygen. This caused her continual distress and anxiety, as she experienced a constant feeling of suffocation. The nightmarish symptoms of ENS can manifest the moment you wake up from surgery, or they can gradually gain momentum as the damaged nerves die over a period of time. This process can take anywhere from weeks to years to develop. Victims of this condition suffer from a never ending panic state they cannot control. Significant stress is placed upon the mind, negatively affecting the body at the same time. Stress hormones are released that cause damage to the various organs of the body, all of which can produce truly catastrophic injuries. The social impact of ENS upon the victim can be devastating as well, including the loss of one’s family, marriage, job, home, and independence. Far too many patients afflicted by ENS have taken their own lives after suffering relentless suffocation as well as the ignorance of doctors to their actual condition. Sometimes the condition has been relegated to a psychiatric disorder instead of a legitimate physical condition with specific symptoms. Some have deemed living as a paraplegic a much better option than living with ENS. Suffering medical malpractice due to a botched nose surgery or other form of negligence can be a devastating experience. The Knoxville medical malpractice attorneys at Banks and Jones are committed to providing you with tenacious and intelligent advocacy to help you recover the compensation you deserve for your injuries and losses. To arrange a free consultation about your case, call us today at 865.407.2122 or fill out our contact form.